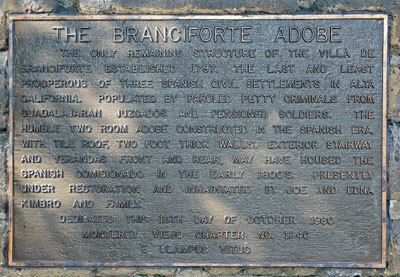 The Branciforte adobe is the only known structure remaining of the Villa de Branciforte founded in 1797 by Spain to discourage British and Russian colonial expansion on the coast of California. 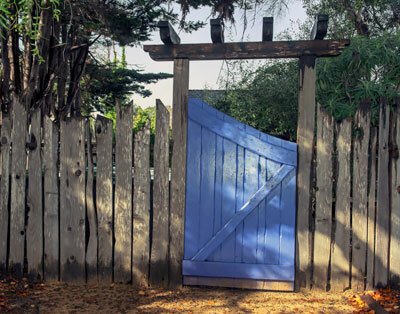 The adobe is located on North Branciforte Avenue which was possibly plotted in 1797 as a one mile long race track by Lieutenant Alberto de Cordova of the Spanish Army Corps of Engineers. The earliest known occupants were José de Jesús Lorenzana (1817-1863) and his wife and children. José was the oldest son of Macedonio Lorenzana who settled in Branciforte in 1824 and held a number of public offices here. Unlike a number of such structures, the Branciforte Adobe was continuously inhabited and never unroofed, abandoned or moved. It is one of only two adobe structures left in the City of Santa Cruz and the only one remaining from the Villa de Branciforte. The only remaining structure of the Villa de Branciforte established in 1797. The last and least prosperous of three Spanish settlements in Alta California. Populated by paroled petty criminals from Guadalajaran juzgados and pensioned soldiers. The humble two room adobe constructed in the Spanish Era, with tile roof, two foot thick walls, exterior stairway, and verandas front and rear, may have housed the Spanish comisionado in the early 1800's. Presently under restoration and inhabited by Joe and Edna Kimbro and family.